Unbroken, the 2010 book by Seabiscuit author Laura Hillenbrand, might have been called “The Passion of Louie Zamperini.” A U.S. distance runner who competed at the 1936 Olympics (the Jesse Owens-Hitler games), Zamperini spent 47 days at sea in a life raft during World War II before being rescued, imprisoned and tortured by the Japanese. The 2014 movie adaptation—directed by Angelina Jolie, with writers including Joel and Ethan Coen and Richard LaGravenese—was an epic tale of physical survival. Spiritual survival was another story. 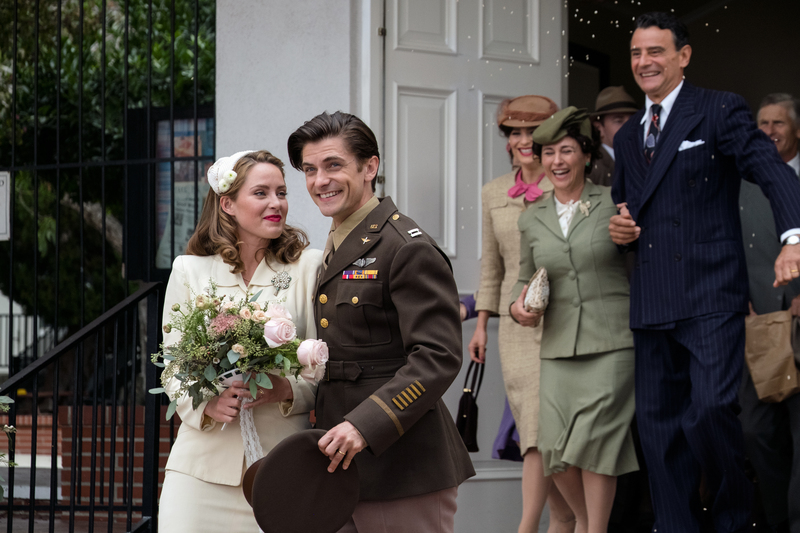 And that’s the story behind “Unbroken: Path to Redemption,” directed by Harold Cronk (“God’s Not Dead”) and starring Samuel Hunt and Merritt Patterson. It delivers the rest of what Hillenbrand included in her book: Zamperini’s return to California, his descent into a PTSD nightmare of alcoholism and self-destruction. Also, an obsession with avenging himself against Mutsuhiro Watanabe (David Sukurai), a.k.a. “The Bird,” the sadistic Japanese officer who was his chief tormenter, who appears in Zamperini’s ornate dreams like something out of an old Hammer Studios horror movie. As the title suggests, the film is also about the salvation of Zamperini’s soul, something accomplished partly by a late ’40s encounter with evangelist Billy Graham, but also through the steadfastness of his wife, Cynthia (Patterson), whose belief in prayer, and Zamperini, keeps her from leaving him forever when that seems the wisest option. While Hunt’s performance is all but nuance free, Patterson—who coincidentally looks like a movie star out of the ’40s—provides an infectious energy that might not be quite fully incorporated into the rest of the film, but certainly makes this under-budgeted project less difficult to watch than it might have been. Most of the people in “Unbroken” aren’t cartoonish exactly, but they are a bit like billboards. The chief woe of “Unbroken” is its agenda—and the fact that it has an agenda. As Samuel Goldwyn once said, “If you want to send a message, use Western Union.” Cronk is far more interested in using his actors as a delivery system for his by-the-numbers script (by veterans Richard Friedenberg and Ken Hixon) than he is creating believable, layered characters to whom we can surrender some emotion. Most of the people in “Unbroken” aren’t cartoonish exactly, but they are a bit like billboards. At a welcome home party at his parents’ home in Torrance, Calif., a family friend, Father Cardarelli (Miguel Perez), calls Louie’s return a miracle. Louie prefers to credit a pair of atomic bombs. “Don’t discount God’s role in your journey,” Father Cardarelli says. “I pray all the time,” Cynthia says cheerily, and while this feels genuine enough coming from Patterson, it also feels like a box being checked. It is Cynthia who gets Louie back on track, for a time, training for what he hopes will be a shot at the 1948 London Olympics. A twisted ankle—something he blames, quite directly, on God—ends that bid and accelerates Louie’s downward turn. He goes into rages; he watches those crazy, baroque melodramas in his sleep; during dinner in a restaurant with friends, a waiter brings a bowl of rice and Louie hallucinates that it’s crawling with worms, the way it was served in camp. He attacks the waiter. But the most psychotic moments are far less convincing than Cynthia’s earnest attempts to get Louie to go see Graham when the evangelist holds his Los Angeles Crusade of 1949. It was the preacher’s first great campaign, during which he addressed approximately 350,000 people, 3,000 of whom reportedly converted to Christianity. One of those people was Louie Zamperini, who became an evangelist himself. It sounds so simple. And in “Unbroken: Path to Redemption,” it’s portrayed exactly that way. You don’t need a whole movie for that kind of experience. All you have to do is read the title. Zamperini was captured. The President of the United States admires people who were no captured. Good point. Give Prez the Great some credit. He was never captured by the Vietnamese communists. Stealthy guy.